Body Wash is the best way to keep the baby’s body clean and fresh all through the day. Babies have a delicate and sensitive skin which requires specific products to keep their skin healthy and soft. There are many types of body washes available in the Indian market. One of them must be carefully chosen after proper testing on the individual baby’s skin. Cleanliness is what you must give to your baby always as without it your baby can get affected by infections spread by bacteria and virus. Just the way we take bath, babies should also be provided the scope of taking bath. Simple soaps and body shampoo for adults should not be used for babies. The skin of your baby is extra sensitive which might get damaged if little harsh product with chemicals is used. Thus, market has a variety of such wonderful baby washes from where you can choose for your baby based on your budget. It is a lovely baby product to ensure a relaxing bath experience to the baby. It containschamomile extracts and natural olive oil which ensures proper conditioning of the skin in a gentle manner. The baby is very comfortable and refreshed with this body wash. It provides a natural glow to the skin and makes the skin soft.. It removes all the impurities and dirt from the body. It is suitable for all types of skin and causes no irritation or rashes.It is mild in natureand hasa beautifulfragrance that keeps the baby smelling good throughout the day.It is an ideal choice for new-born babies. This body wash ensures a relaxing baby bath session to the baby. It cleans and moisturizes the delicate skin of the baby.Since this Mothercare baby wash is hypoallergenic, it can be used on sensitive baby skin as well. It is a soap free cleanser that cleans without drying the skin. It blends natural oat extract into a rich, lathering wash. 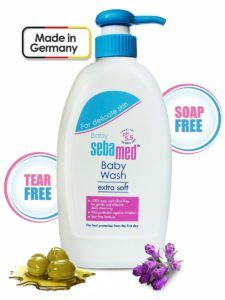 It gently cleanses the skin and leaves a soft, fresh fragrance on the baby’s body that lasts throughout the day.The hypoallergenic quality makes this wash suitable for everyday use on new-borns and babies with sensitive skin. It is a gentle body wash and shampoo gently cleanses the delicate baby’s skin right from the first bath up to three years of age. It has soothing and softening oat properties. Its formula is tear free which protects the eyes from irritation. It consists of all natural ingredients and is free from harmful contents like dyes and alcohol. It is an ultra-mildcleanser that is designed for use on baby’s delicate body and hair. It cleanses the skin without drying because it is completely dye free and pH balanced. The proven formula of no more tears makes it hypoallergenic. It contains the goodness of shea and cocoa butter.It gently cleanses the baby’s body and hair with a mild, No More Tears formula that helps tohydrate and moisturize the skin. It is suitable for new born as it gently cleans and leaves the baby’s skin moisturized. It is found to be effective against cradle cap, dandruff, dermatitis, eczema and lice. A clean and beautiful blend that includes organic tea tree and French lavender with sweet citrus and floral base notes makes it an exclusive product for most babies.Tea tree has anti-bacterial and healing properties, while French lavender is calming and soothing. The brand Himalaya is making a great effort to get a lead in herbal market. To some extent it has also been successful. You can now get variety of baby products from this particular company. This product is totally safe for your baby that cleans the skin of your baby and provide further moisturizing phenomenon. It is totally a safe product without any side effects. You must read the customer reviews before getting the product from the market. This is a new brand of baby essential product available in the market. The product is now available in the well known online shopping store. It also comes with no more tears formula. During the bath session it is quite likely that your baby can get the wash inside his eyes. But, this is made with such a formula that even if it gets inside, it won’t be harmful. This can be used for your new born baby wash without hesitation.